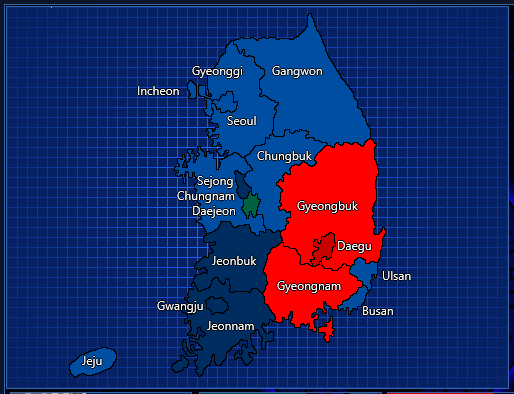 Fueled by a playable and thankfully shared South Korea 2017 scenario from @daons I am back with an adjusted scenario of one of my most favourite countries. It needs more improvements though. Perhaps someone wants to do this (I can assist if you have questions, I am not fluent in Korean but I find myself going through Wikipedia without major difficulties at least), maybe I find time to improve the scenario as well, we will see. South Korea has democratic elections since 1987 and I would love to develop all elections, at least to be playable with the candidates who ran. If we make them good enough perhaps, Anthony wants to include them as official campaigns. (and I still hope to have a consecutive elections feature one day) I do not know how the state currently is. This entry was posted in 1. President Infinity, World by Conservative Elector 2. Bookmark the permalink. I’ve been meaning to make one like this and it’s awesome to see that you did it. One thing to edit is to make the election season. I’m not sure if the election is actually 22 days long, but president infinity mechanically works better if the campaign is longer. Also, staggering the states to report at different times would be cool. Thanks! I am glad you enjoyed it. I can assist you if you plan to edit the scenario to get historical Korean election (2012 backwards). It is my plan to develop those as well. For the campaign length: according to Wikipedia the last candidate was nominated April 4th, and the official campaign started on April 17th, while the election was on May 9th. I know that is short, but it is a small country. I could adjust the length, but it would be accurate. For the times: I thought about that too, but I have no information regarding closing polls, I can sort them in a meaningful way (rural areas reporting first).